Allan Eaglesham's March 2007 report (http://www.manuscriptservice.com/Headstamp/) on the cartridge case found in Dealey Plaza by John Rademacher is potentially another blow to the James Files' story. However, for James Files' defender Wim Dankbaar there is much more at stake. Mr. Dankbaar is relatively new to Kennedy research. The Spartacus web site indicates, "He first became interested in the assassination of John F. Kennedy in 1988." And with respect to the Files' story, he has less than five years experience and was dependent upon others, including Files himself, to provide "evidence" supporting the contention that Files was the Grassy Knoll assassin. In 1996 when I obtained my copy of Files' purported confession* two things struck me as odd. 1] Files' erroneous assertion that there was a last minute change in the motorcade route. His allegation about the change occurs at 14:35 from the start of the FBI warning. 2] Files' claim that he used a Remington XP-100 to shoot Kennedy in the left, that's correct left, side of the head. This claim is found at 18:58 from the start of the FBI warning. So in his video taped confession Files makes two statements, along with at least five more, which are historically inaccurate! Over ten years ago I brought these two significant errors to the attention of Files' then producer/agent Bob Vernon. I never got a proper response as Mr. Vernon chose to dismiss both out of hand. Curiously neither Files' nor any of his proponents has ever stepped forward to provide a suitable explanation. Additionally, from 1996 onward Files' supporters have engaged shoehorning spurious evidence to fit Files' claims. Those who don't fall in line and get with the program are labeled disinformation agents and worse. This is not new. The same thing happened with the previous supposed Grassy Knoll assassin, Roscoe White. Back in August of 1990 Roscoe's son, Ricky, claimed his father was the shooter and part of a massive conspiracy and cover-up. 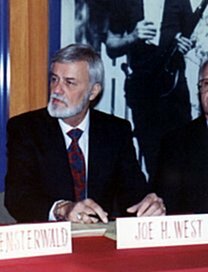 Ricky and Joe West used some of the same shady characters and "evidence" Files would later provide. When competent researchers questioned Ricky and West's proofs they and a host of others went ballistic threatening lawsuits and Texas Attorney General intervention. In particular Ricky White depended upon the now defunct JFK Assassination Information Center to attack anybody who dared opine that the story was a hoax. This tactic was employed even after Geneva White, Roscoe's widow, admitted to forging some of the evidence. Why all the vitriol from the JFK Assassination Information Center? Gary Mack was instrumental in discovering that Ricky White and the Center's co-director, Larry Howard, met with Oliver Stone and tried to peddle the story to him for $750,000. Three quarters of a million dollars is strong motivation to shade the truth and shut down any real or imagined opposition. And even though the Roscoe White story has been shown to be a hoax there are those who just cannot bring themselves to believe they were deceived. The usual qualification follows the line, "Yes I know there are problems but there may still be something there." In my view, we have something similar happening here. There is a big investment in time, effort, and money by Mr. Dankbaar. If the story is disproved he becomes a buffoon taken in by a promoter who provided evidence of questionable provenance. And as with the Roscoe White story, Mr. Dankbaar has hundreds of thousands of reasons to dismiss contrary evidence and ridicule those with an opposing view even if their theories are supported by the evidence. "I don't think Jimmy's a fraud. Another explanation is: the casings were planted as a ruse by someone who didn't realize that the headstamps were not struck until 1971. Another: a switch occurred in order to trick a buyer of these bogus casings into thinking that these fake "teeth indentations" were rare proof positive of Jimmy's story. Wasn't Jimmy's map of his location at Dealey very close to the unindented casing's locus?"